When it comes to recover lost or deleted photos from a hard drive, USB flash drive, or an SD card, you have no other option but using a reliable and efficient photo recovery software. Stellar Phoenix Photo Recovery software lets you recover all your lost or deleted photos, plus audio and video files, thereby keeping their original color, effects, and all other properties intact. The best thing about this photo recovery software is its user friendly GUI that makes it a DIY (Do-it-Yourself) utility. Any Windows based computer that meets the aforementioned system configuration can run Stellar Photo Recovery software smoothly. Scan Options Selecting the hard drive provides two different scan options (San Now and Advanced Scan) that are entirely different from one another in the way they scan it. The ‘Scan Now’ option initiates scanning the selected partition thoroughly, based on the scan preferences set. In contrast, the ‘Advanced Scan’ option lets you filter the scan process for all three types of media (Photo, Audio and Video files). More precisely, this option lets you scan and recover selected files, even from a particular region of the selected partition. For this, a separate tab – ‘Select Region’ is provided. Filtering the Scanned Result Scanning a particular partition or the hard drive generates a ‘Tree View’ in the left pane of the scan window, where the items in the tree are the folders in the drive, which are displayed in hierarchical order. Each item (or folder) in the tree has a check box right in front of it, which enables saving the selected folders from the scanned result. Deleted List The software generates three different types of ‘Lists’, displaying the ‘Tree View’ in three different styles, viz. ‘Classic List’, ‘File List’, and ‘Deleted List’. • ‘Classic List’ displays all folders located in the scanned drive in a hierarchical order. • ‘File List’ displays only three, i.e. Video, Photo, and Audio folders that contain both currently present and deleted items. • ‘Deleted List’ contains all the items that have been deleted from the scanned partition. Later Recovery Stellar Phoenix Photo Recovery software lets saving scanned information (*.DAT file) on your computer, which can be used to resume recovery at a later time. However, the presence of the original drive is mandatory. Besides, your can create image (*.img file) of a partition or the entire hard drive (requires another hard drive to save), and the same can also be used to resume the recovery process afterwards, no matter if the original partition or the hard drive is available or not. While the selected partition is being scanned, the software generates on-the-fly preview of the items it recovers. You can reveal the contents of a folder in the bottom right pane by selecting it in the tree. Each item displayed with a cross sign on it marks that it is deleted. The upper right pane displays preview of the file selected at the bottom. 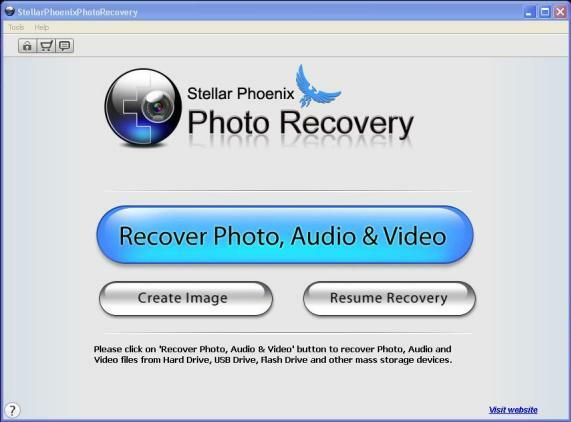 Stellar Phoenix Photo Recovery v6.0 is easy to use and efficient media (photo, audio and video) files recovery software. Though the software is pricy, it works efficiently and in a reliable manner.